SharePoint is a complex platform and it's full of possibilities. There are a lot of settings and parameters that your end users can play with. In fact, they can modify settings in almost every single object in your environments, and Sites are no exception. Wouldn't it be great to be able to easily list all your SharePoint Sites along with their size? SharePoint doesn't give a simple way to review information about your site out-of-the-box. Sure, you can go in SharePoint and gather information, but it's not always as intuitive as we all would like it to be. In this post, I'll give you 4 options to list SharePoint Sites and get their size. 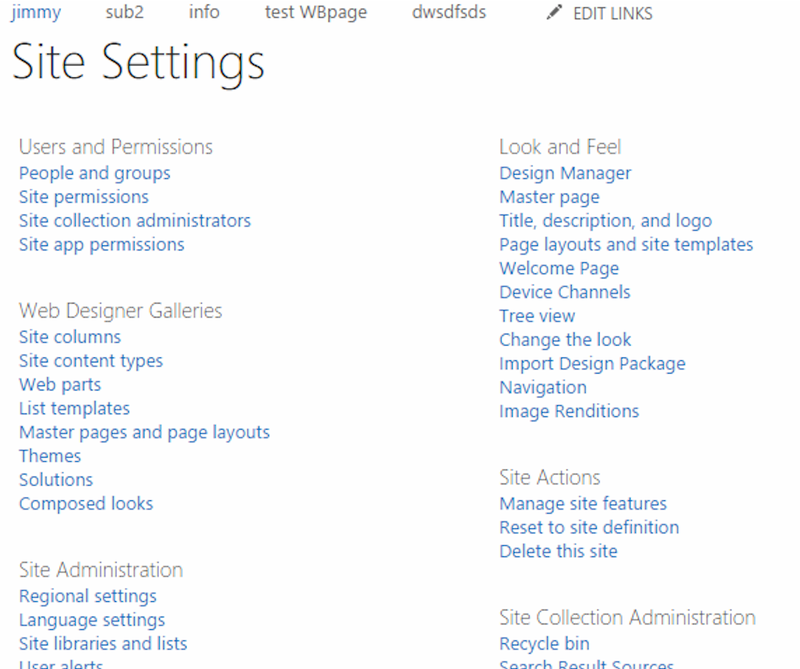 You're probably already familiar with the "Site settings" page in SharePoint. This page shows a list of several dozens of settings that are grouped into different categories like "Site Administration", "Site collection Administration", "Look and Feel", etc. Each category displays many, many links to pages where you can edit different settings. The first thing you notice here is the impressive number of options that are given to you. The second, is that you might not necessarily know where to find that specific information that you were looking for! If you don't know exactly where to find the setting that you want to adjust, you'll probably need to go through the entire page to find it. Go under the "Site Collection Administration" category. 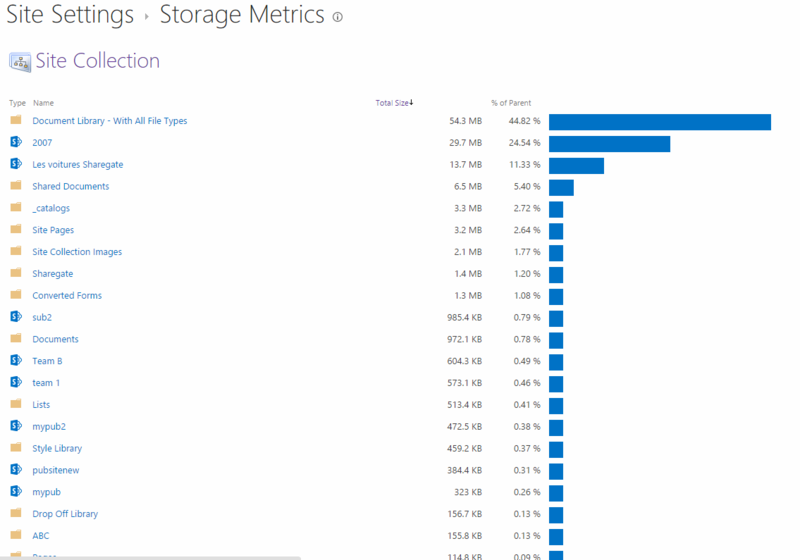 Go to the "Storage Metrics" page, you'll see a list of objects with sizes right beside them. Open Excel and copy/paste all the Site names and their sizes. This object list is often a few pages long. It'll take you a long, long time to achieve this. It's not ideal! Another option is SharePoint Designer. This tool can give you a ton of useful information about your Sites. 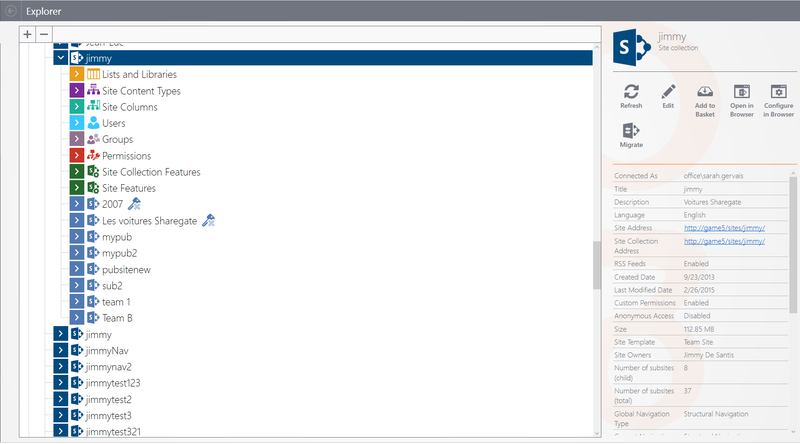 Connect to your Site in SharePoint Designer. Go to the "Site Information" section on the home page. Copy the total storage used by your site. Paste the name of your site and its size in Excel. The problem with SharePoint Designer is that you can only access one site at a time. So again, having a list of all your sites and their sizes would take you forever. Of course, since the example here is getting the size of a site collection, it's legitimate to mention that this is possible with PowerShell as well... If you're familiar with the tool that is! A lot of scripts like this one are accessible online. However, I believe it's fair to say that this isn't the most user-friendly option since not a lot of users are comfortable playing with PowerShell Scripting! Get a list of all your Sites with their basic details with a built-in report. Navigate through your farms with the Explorer. In Sharegate's main screen, click on the "Report" menu. Click on "Site with basic details" report in the Lifecycle category. Select your SharePoint or Office 365 environment. Let Sharegate do the work and review a list of all your Sites with their size. This report will give you basic information on each of your sites: title, site address, size, last modified date, and owners. Sharegate contains a tool very rightfully called "The Explorer". It allows you to navigate into your multiple farms no matter if you use SharePoint or Office 365. Let’s find the size of our site collection with the help of Sharegate! First, you'll need to connect to your farm or site by clicking on the plus sign, and using the authentication method that you prefer. Surprise! You can already see the size of the site, and also a lot more information in the panel on the right side of your screen. As you can see, the tool is user-friendly, and the navigation tree facilitates the exploration a lot. We can navigate through all the lists, site content types, site columns, users, groups, permissions, site collection features, site features, and sub-sites. All of this in the same window! Moreover, this applies not only to the site itself, but to all of its objects as well. You can view information specific to a list, a site column, a user… Listing your site’s information is now extremely simple. What's also great here is the Edit button in the right side panel. You can add or remove administrators to your site, activate or deactivate features at the site or site collection level, activate versioning on a list, or add members to a group. The Explorer can definitely save you a lot of time. The potential with this tool is immense as it's efficient, and allows you to manage your whole site in one place. You can find additional information on the explorer here. No matter what solution you choose to use, you'll get the information you're looking for. It's just a question of how much time you're willing to spend on something that can be done in under a minute.